The school we all knew as Hathershaw Technical High School has gone through many phases and names, both before the HTHS period and after. I will try to briefly sift through the school's interesting and chequered existence. Its history as a school as opposed to a building goes back to 1942 and it has in its own unique way mirrored, throughout its history, the educational trends of the period. The man most responsible for instigating all the phases of the school up to 1967 was the first Headmaster Charles Clifford Bell or 'Charlie' as he was affectionately known. His far-sightedness was directly responsible for the progress and direction the school was to experience in its first 25 years. It is perhaps a pity that nobody realised in 1967 when he retired that the school was celebrating its first Silver Jubilee. The school had its beginnings in a couple of classrooms in Greaves Street, Oldham, just opposite the Lyceum building where the Class of ’59 will hold their 50th Anniversary Reunion in October 2009, where Mr Bell was the Teacher-in-charge. The building became The Local Interest Centre and more recently the home of Oldham Theatre Workshop. It was an off-shoot of the Technical College in Ashcroft Street and was known as 'The Junior Tech'. It catered for 11+ failures who had shown a particular aptitude for practical/technical subjects in their Secondary Modern Schools. They often entered at the age of 13 for two years, on the recommendation of their headmaster. The school was populated by boys only until 1944 when the first intake of girls arrived, three to be precise. With increasing emphasis being given to technical education at the time, the school increased in size annualy and the variety of subjects available also widened. 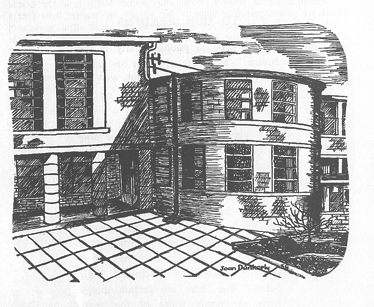 By 1951 the building was bursting at the seams and the school was moved to more suitable premises in Ward Street. It is interesting to note that many of the staff who moved to Greaves Street, most of them emergency trained,stayed on at the school until their retirement. In fact, one member, who came to the school in 1944, was still teaching at the school when the building celebrated its Silver Jubilee in 1980. Ironically he remarked to Mr Bell, on his appointment, that he would stay no longer than three years. The school now became known as Robin Hill Secondary Technical School and although students still entered at the ages of 12 and 13, and it was still populated in the main by 11+ rejects, students were now able to opt to enter the school, on passing the 11+. The first “O” Levels were sat in 1953 with courses offered in predominantly technical and practical subjects, the humanities taking a definite’back seat’. Examples of courses available were: Painting and Decorating; Building; Plumbing; Geometrical and Engineering Drawing; Metalwork and Woodwork. Very soon the number of girls entering increased dramatically and courses in Shorthand and Typing, Home Economics and Commerce were instigated. The school had gained such a high reputation amongst industrialists, especially AVRO and FERRANTI, for the high calibre of its students, that the Authority decided to authorise a new, purpose built school with sponsorship from AVRO, on whose Lancaster Bomber the school’s design was based. In 1955 Hathershaw Technical High School opened its doors for the first time. The new school now fully entered the ‘selective system’, joining with Counthill and Greenhill Grammar Schools. In its first few years it was still predominantly unselective in its make up, with the majority of students coming from Ward Street. For the first few years though, the school followed its tradition and as wll as two selective classes entering there was also a ‘Remove’ form consiting of 12 year olds who had passed their 12+ and who joined after one year in a Secondary Modern School. They were expected to do their ‘O’ Levels in just four years. Although the syllabus widened, it was still very technically biased. The machinery in the metalwork and woodwork areas were considered to be the finest in the country. Visits to see these from other Authorities were almost a weekly occurrence. Much of that self same machinery existed into the 1990’s and was still envied by schools built after Hathershaw. In 1996 Oldham went Comprehensive and HTHS became Hathershaw Comprehensive School and took its first non-selective intake in September of that year. In 1967 Mr Bell retired and Mr Hemmings became the new Headteacher. In order to cope with rising rolls the old Greenhill Grammar School building, one and a half miles away, was taken as a Lower School Annexe, staff and children travelling between the schools. This was to prove completely unsatisfactory as much lesson time was lost. In 1970, because of the difficulties outlined above, the Authority decided to make Hathershaw a 14 to 18 Comprehensive School with the Greenhill building(the old Hathershaw Annexe) and Fitton Hill School becoming 11-13 Comprehensive feeder schools for Hathershaw with their own Headmasters. This period coincided with ROSLA (Raising of the School Leaving Age) and many extra buildings known as ‘ROSLA blocks’ were added to the school. This period in the school’s life was probanbly its most difficult. The new system never really worked as 14 was a problematical age for children to change schools. To compound the problem Greenhill’s school population was mainly composed of children from ethnic minority groups whereas Fitton Hill had few if any of these children. The intake of the feeder schools suffered as parents realised the difficulties and opted for schools that were traditional 11-18 Comprehensives. In 1976 Mr Hemmings took a secondment, to be replaced, on a temporary basis, by Mr J.H.S. Cole, the Authority’s Assitant Director of Education. When in 1977 the post was advertised, as Mr Hemmings had taken early retirement, he applied for the permanent post and was appointed Headteacher. The Authority realised the shortcomings of the system and Hathershaw reverted to an 11-18 Comprehensive School with a six form entry. (Greenhill closed down later to open as a Primary School and Fitton Hill became an 11-16 Comprehensive.) The school prospered during this period, exam results improving and the school being fully subscribed. In 1981 Oldham's first joint school/community sports hall was built here. Mr Cole retired in 1988 to be temporarily replaced by Miss Cunnington, until Mr C Midgley, a former Deputy Head at the school, took over the reins. With the advent of the 6th Form College the school reverted back to a 11-16 Comprehensive, losing its 6th Form. Mr Midgley left and Mr C. W. Edney took over the reins. In December 1999 it was recognised by the Government as one of the 50 most improved secondary schools in the country. September 2000 - the school became a Technology College . May 2003 - the school became members of the Specialist Schools Trust "Value Added" club for significantly improving examination results between Key Stage 2 and Key Stage 4. Mr Edney left and Mr David Ashley became Headteacher. November 2004 - the school received over £1 million in lottery funding to improve its sports facilities. March 2005 - the school became the first dual-specialism school in England, specialising in sport as well as technology. In October 2005, the school opened a new £350,000 netball complex. Mr Ashley left and Mrs Carol Cawkwell was appointed Headteacher.